A beloved, albeit ambivalent, saying about Vienna goes: “When the world ends, I’m heading to Vienna, everything there happens 50 years later.” Actually, the jury is out on whether the original statement predicted it would take Vienna 10 or 50 years longer to end and whether the Austrian who declared it was the composer Gustav Mahler or the satirist Karl Kraus. Regardless of who the sage was, and however long Vienna would need to catch up with the rest of the world, it is exactly this saying that came to mind yesterday evening while dining at the Pfarrwirt. What you won’t see when you visit the convenient online-reservations section of Pfarrwirt’s professionally done website is any indication that this restaurant has a smoking and non-smoking section and has reserved the superior seating for the friends of Phillip Morris. The reservation form poses all the necessary questions EXCEPT a preference for smoking or non-smoking. In fact, nothing, NOTHING, on the carefully crafted website, complete with a gallery of room-by-room photos, gives any visual or written indication that your dining experience will begin by navigating through a hanging cloud of fumes to arrive at the non-descript back room sectioned off for non-smokers. 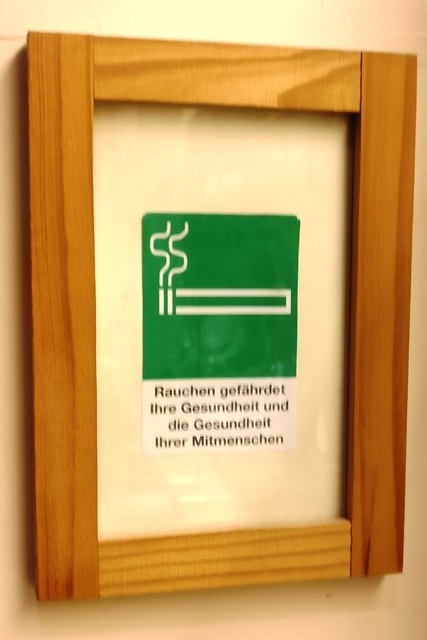 Assuming, of course, you are lucky enough after-the-fact to secure a non-smoking table. (Unfortunately, we weren’t). Immediately upon detecting (smelling) our dire reservation mistake two minutes after being seated at our first charming table, the staff was professional enough (or accustomed to such last-minute requests by unpleasantly surprised guests?) to swiftly re-situate us to an alternative table directly outside of the glassed-in, far smaller, non-smoking section (which, not surprisingly, was full). This new table was where hope went to die. Instead, of counting our losses and high-tailing it out of there, we recklessly remained seated and ordered, falsely believing that the two bouncing, bright-eyed 6-month olds at each of the tables next to us would guarantee a smoke-free evening. Ten feet away, three perniciously determined nicotine addicts worked their tobacco-stained way through enough Marlboros to make up for every non-smoking diner present. 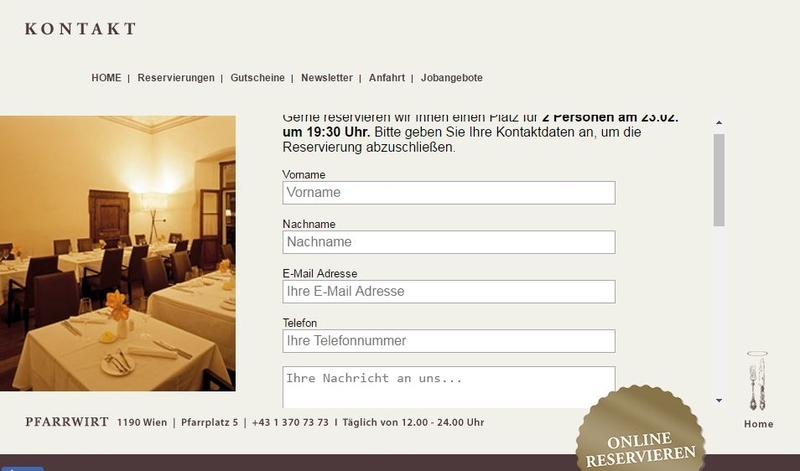 The Pfarrwirt boasts that it is Vienna’s oldest restaurant. Nestled in an enchanting, cobble-stoned square beside a picturesque church more than seven centuries (!) old, I don’t doubt that it’s true. The whole locale oozes in so much Old-World charm, you want to bundle it up and preserve it on the front cover a Christmas greeting card. Assuming, of course, that you don’t mind if the golden-winged cherubs wishing you “Good Cheer” all have Pall Malls dangling from their pouty, angelic lips. When you go out to dinner, and particularly when you are entertaining guests from abroad, you really want three things from your restaurant of choice: 1) savory meals (and quality wine) 2) professional staff and; 3) an atmosphere that imbues you with the sense that everything has come together in effortless perfection. Pfarrwirt achieves the first two of the three. The food was good (not great but good – though the chocolate mousse was great), the wine selection okay, the staff attentive but not overbearing (though when I kindly suggested a smoking/non-smoking button option on the website, our waiter seemed to imply it was my mistake for not mentioning my preference in the “Your message to us” box at the end of the page), but when the place reeks of cigarette stench so stifling that every non-smoking diner feels asphyxiated, no stretch of the imagination can describe the dining experience as “imbuing a sense of effortless perfection coming together.” In fact, if you venture to close your eyes in an attempt to grant them a temporary break from the stinging fumes, rather than the fine aroma of Schnitzel inspiring illusions of a visit to one of the city’s best restaurants, the pestilent odor of Lucky Strikes conjures up images of a fenced-in courtyard of a high-security prison facility. With main courses ranging in price from 12 to 30 Euros, you expect a high quality dining experience that will be impossible for Pfarrwirt to ever achieve as long as it persists in allowing a nicotine haze to permeate its air, penetrate its food, and invariably taint what-could-have-otherwise-been a (positively) memorable experience. Two out of three ain’t bad, but it ain’t nearly good enough. In fact, in this case, it was highly disappointing. For a restaurant that once had a smoking section and then decided it was time to go completely smoke-free, check out a local favorite – the Schöne Perle. No, it is not Vienna’s oldest restaurant and it does not look so quaint that it belongs on a Christmas card, but you will be guaranteed good food, good service, and a smoke-free atmosphere. (Reservations recommended). Save room for the Susi Torte for dessert. Decadence embodied. Usually one serving with forks for everyone is the way to go! Sorry – long time no hear but I swear, I am hard at work with my studies, reading, researching and writing papers. But life mustn’t be all work and no play. 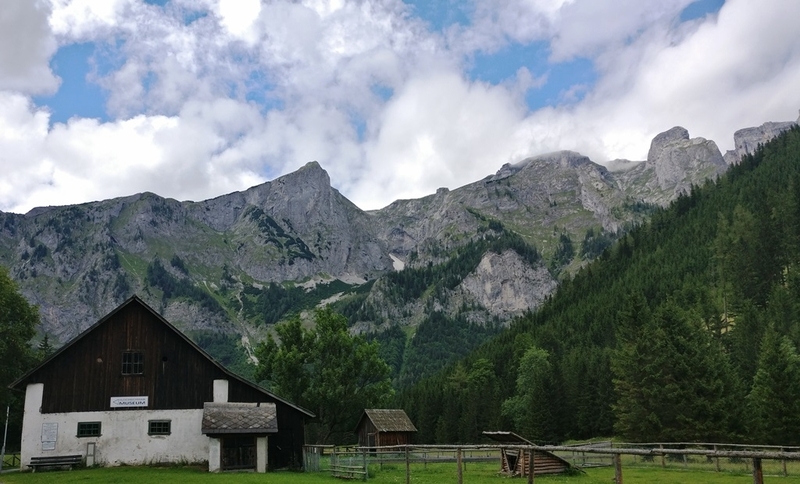 So…just for you… some beautiful mementos from a recent hike in Austria’s very gorgeous Hochschwab region. 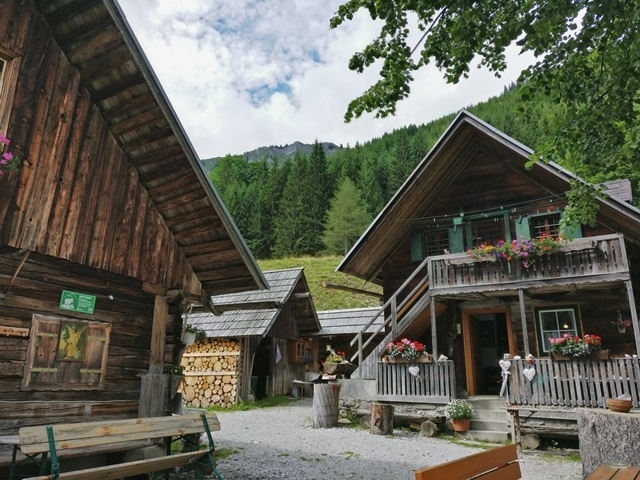 Spend a weekend at this gem of a guesthouse where the St. Ilgen valley ends and is surrounded by a majestic panorama of mountains: Bodenbauer (http://www.der-bodenbauer.at/der-bodenbauer/anreise). From there venture up and out into some breathtaking walks, treks, hikes, and climbs. 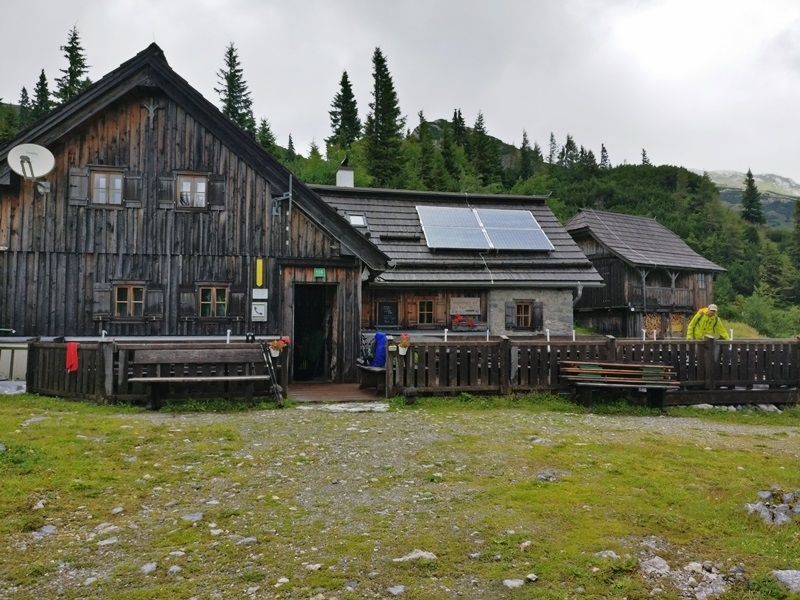 A short hour-long trek will take you to the lovely Hainzlhuette where cows laze happily in the meadow and the Wirtin will serve you up a very tasty Brettljause and refreshing drinks so you can tank some energy to power onwards. Further up the mountain about 2 hours straight up from Bodenbauer is the Häuslhuette situated along a route that is better marked than the Hainzerlhuette route (Haeusl Alm website). The Häuslalm is along route 840. Consider downloading maps of the area before you go because the markings aren’t always optimal. And if you are crazy enough to venture up in pounding, stinging rain, dragging your soaking wet body, step-for-step upwards like I did, you might just have a Frodo-like experience that would make the entire effort worthwhile. Cold, rain-beaten, and tired, you might just enter an abandoned-looking hut after the two hour hike that seemed oh so everlong to find an interior filled with the warmth of a wood-burning stove, the scents of homemade grilled Bratwurst, an abundance of drink and an over-bursting of song and merriment. Unbelievable. 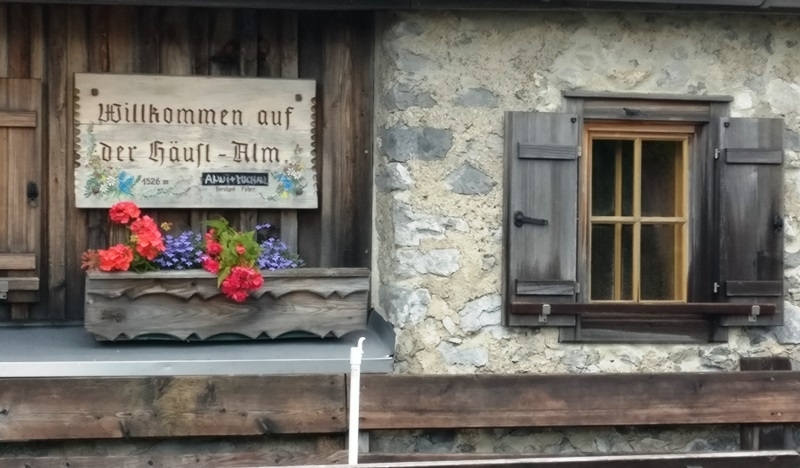 Not only was the hut busting at its seams with hikers out in that weather (some who climbed over in hail and snow), there was an accordion, an accordion player and a cabin full of beer-mug-swinging Austrians who knew all the lyrics to all the songs he played. Good times were had by all and I may have been mistaken, but I could have sworn there were some hobbits in the corner milking their Barlimann’s Best. Indeed, thank goodness this world has more to offer than work and perfect weather. Life is short, make the best of it! QUICK – THE ROSES ARE BLOOMING NOW! If the best things in life are free and you should take the time to stop and smell the roses, then you must make you way to Vienna’s Volksgarten lickety-split because the roses are a bloomin’ and it is one gorgeous site to see. Take my word for it and go! Now! I am not a wine connoisseur. I’m just not. I will admit though that when I once went to a wine social in the US and the “glasses” were plastic cups, I opted for the water instead but I am no wine snob. I like wine. I drink wine. I have no idea what officially makes a good wine, I just know when I drink it, that either enjoy it or I don’t. 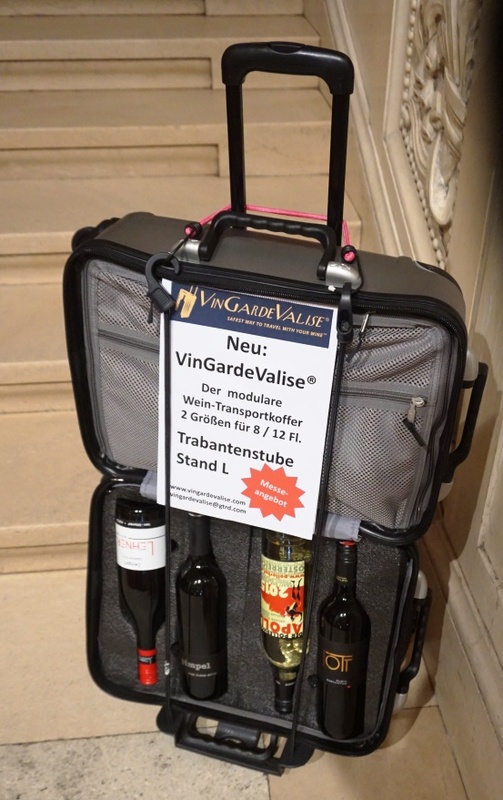 But my obvious lack of wine 101 hasn’t stopped me from attending VieVinum (http://www.vievinum.com/) in the Vienna Hofburg for the past three years. After all, I might not know a thing about wine, but I do know you don’t serve it in a plastic cup (unless you’re backpacking in the wild). And I happen to agree with the old Viennese song that maybe there’s a little vine louse in all of us. 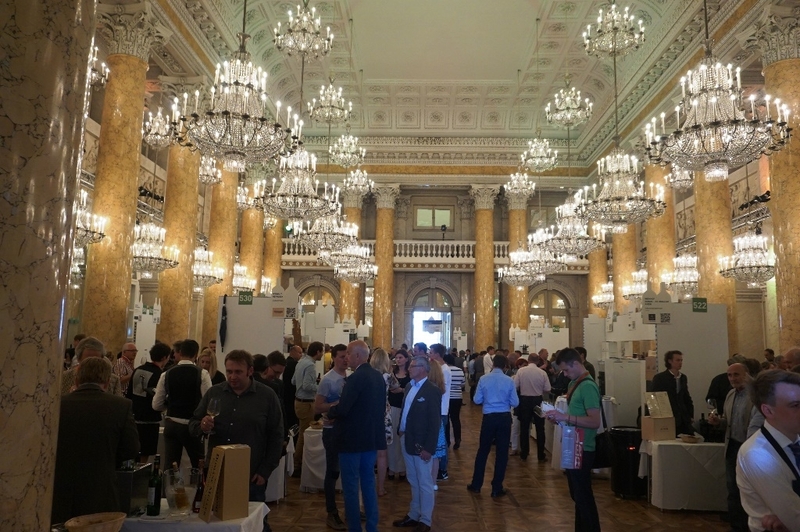 In Austria in the beginning of June you can let that inner vine louse go wild when hundreds of wine growers come to the Vienna Hofburg to present their best drops of nectar for three glorious days. Your 40 € ticket gets you access to room after room of local and international wineries. Lady Luck shone upon me this year and I won two tickets so I got to spend the afternoon sipping wines on someone else’s tab (thank you, Metropole!). You stopped processing at the 40 € ticket. Okay, 40 € may be a steep entrance fee price but this isn’t an Epcot Center make-it-look-real-and-pretend-you’re-there façade and doesn’t even cost you a fraction of the price. This is it. The real thing. A once-a-year event. You can spend an entire afternoon (heck, an entire day if you’re so inclined) meandering through the opulent chambers of the former emperor’s palace while nipping on unlimited wines served by growers in Lederhosen and Dirndls. And the ambiance’s completely chilled. Remember all the times you promised yourself you would work to live and not live to work? This is those times – the living, the memory-making. Go for it! And let’s face it, by the third grower, you will no longer be worrying about the steep ticket price, you’ll be looking to the next table, the next bottle, and the next smooth, chilled Veltliner. No. I didn’t get drunk enough to buy this baby but it was tempting even before the first drink – imagine the hissy fit this would cause the US TSA and how eager those guys would be to confiscate it. The surprise of the afternoon was a selection of three red wines from Württemberger Weinberg Werk (www.weinbergwerk.de) – I skipped the first bottle on display and went straight for the Meisterwerk, which was very good but Lebenswerk was even better. In fact, it was so good that all three Austrians who I was making my rounds with praised the smooth, tasty red wine – and for Austrians to freely praise Germans for their wine requires either that the Austrians are drunk (they weren’t, I swear) or for the wine to be that good (it was). Next, of course, was the Steiermark room. All good Austrians go to the Steiermark for great wine (and wonderful thermal spas) but where to start? We stood in the middle of the grand room, glasses empty, eyeballing all the possibilities and that’s when – like Eve in the garden of paradise – I turned to see the snake wrapped around the bottle. And with a name like Hirschmugl (Domaene am Seggauberg, Seggauberg, Steiermark – http://www.hirschmugl-domaene.at/) how could a girl resist? I convinced a group that didn’t need too much convincing that maybe the snake was on to something. And we were not disappointed. We particularly enjoyed the Muscaris and Sauvignon Blanc. Don’t judge them by their website – I think they are so busy making great wines, they don’t have time to list all their wines. The Sauvignon Blanc smells so lovely – really such an amazing aroma that in an instant I knew what all the sniffing’s about at those stuffy wine events. And if you are interested in a good excuse to do an outing to the Steiermark (as if one needs an excuse), on Saturday, 11 June from 11 am – 6 pm in Leibnitz, Hischmugl will be opening their wine shop and offering a presentation of their 2015 wines. Vesper, a Grüner Veltliner from the Hohenwarth winery Setzer (www.weingut-setzer.at) was also great. Just the name itself invokes images of labyrinthine, cobblestone lanes in European hamlets, and a lone, romantic table for two on a wine terrace overlooking the vineyards in the warmth of the setting afternoon sun. And at 6.60 € a bottle, you can start saving up for that Vespa to get you there. Another wine I really liked was the 2011 Grand Cuvée from the winery Reichardt (www.weingut-reichardt.at) called Supreme. It definitely lives up to its name and at 11.50 € a bottle, you can take a bottle along when invited for dinner without looking like a cheapskate (unless you have very uppity friends who can’t appreciate a good bottle of 11.50 € wine which means you should probably decline the dinner invitation and drink it yourself while searching for a new set of friends). One winery I actively sought out was Antinori (Tuscany, Italy, https://www.vinorama.at/Weingueter/Marchesi-Antinori-Firenze/) and I found the Dirndl-donning server in the Falstaff room. As a podcast junkie I could tell you a million tidbits about a million-and-one topics so when 60 Minutes’ beloved journalist, Morley Safer, passed away and they re-broadcast his favorite segment about an Italian wine (http://www.cbsnews.com/news/60-minutes-toasts-morley-safer/), my curiosity was piqued. This family has been in the wine-making business for 6 centuries(!) and now three sisters are at the forefront of the operations. The wines presented at the VieVinum were apparently newly acquired wines and they didn’t disappoint. Of course, the classic Chianti tasted like the rolling, green hills of Tuscany in a bottle but the one I thoroughly enjoyed as a perfect, light, summer wine was the Vivia, La Mortelle, 2015 (https://www.vinorama.at/Weine/Alle-Weine/Vivia-Maremma-Toscana-IGT-oxid.html). And an extra goody for those living in or visiting Vienna – the family also has an amazing Italian restaurant in the lane directly across from St. Stephan’s cathedral (http://www.cantinetta-antinori.com/en/vienna/cantinetta-antinori-di-vienna). When I dined there once, the food and atmosphere were so inviting, that I think our little group did like the Italians, lost track of time and ended up staying until closing (no slapping down the check with the after-dinner espresso in these places). I may have missed some of the best wines at the VieVinum. But frankly, I don’t think so. I’ve noted the ones I enjoyed and I’ll be sure to somehow acquire some bottles for home (they all said to send them an email). And every time I drink a Sauvignon Blanc from Hischmugl or a Vivia from Antinori, I’ll remember our afternoon at the VieVinum and the wine will taste all the better for the memory – not just of a beautiful afternoon with good friends but of the wine makers and that twinkle they get when talking about their wines, the history, the barrels, the soil. You listen, swirl the wine in your glass, inhale the fine aroma, and no sooner have you savored the fine texture, and unique flavor, that you find yourself turning to the winemaker with a “Wow ! That’s great stuff.” Immediately you see it – for them this is more than a hobby, more than a product, a business, a way of life – it’s their Lebenswerk, and when done well, a Meisterwerk. And a special treat for you – a Viennese classic to accompany your Achterl – Hans Moser singing about his former and future life as a grapevine louse. i trink so gern a Flascherl Wein.